Sweet Tooth! | Angela M.D. Unlike a lot of women I meet, I am fortunate in not having a sweet tooth. My husband got the sweet tooth in our family. 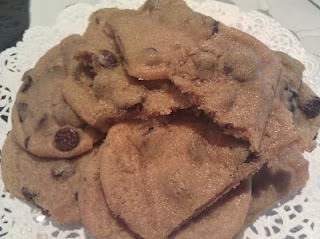 I can generally walk by a plate of cookies all weekend without much temptation to eat one. I do have another weakness. I’ve been known to eat the crispy-salty chicken skin off of everyone’s chicken before it gets to the table. And I’ve had periods of time where I popped and ate a whole bag of microwave popcorn by myself at night. My sister recommended kosher salt on edamame as a salty substitute. Sometimes it works but sometimes not. Here is one thing I’ve learned about good days and bad days in eating well. If I manage to walk by the cookies and refrain from grabbing a couple of cheese puffs, I can manage to stay strong all day and night. But once I let myself slip a little bit — thinking I’ll just eat one Lay’s potato chip or a quarter of a brownie — I’m a goner. Here’s the good part to that: I can also keep a good thing going once I start my day off with flavorful fruits, fun salads and crunchy veggie combinations. Having other people in my house that have very different eating habits is definitely a huge hurdle to jump. I don’t buy bags of chips or snacks, but my husband does, with dip. He also brings home cakes and pastries and fires up the deep fryer at 10 pm to toss in some Buffalo wings. Dieting is hard enough when you don’t have people around who unintentionally sabotage your best day’s work. I guess that’s life though. Lots of women my age are consumed by diets and weight and appearance. We all want it to be easy and it’s not. Still, I have no doubt that it’s going to be worth all of the hard work. I’m not sticking to the plan as 100% perfectly as I would hope, but I’m moving in the right direction. When tempted, remember to just say no!